For a few days now, tension has been rising high in Venezuela. On 23 January, the President of Parliament proclaimed himself president. He was immediately recognized by the US, Brazil and a number of other countries. There are fears that this is the beginning of a long period of confrontation and destabilisation. The attempt to dethrone President Maduro does not come out of the blue. Since Maduro became president after the death of Chávez in 2013, the US has resolutely aimed at a regime change. The US tries to persuade parts of the army to turn against Maduro, but without any result so far. That is why Washington relies first and foremost on the internal opposition and on diplomatic pressure. The US gives assistance to the political opposition and tries to unite it as much as possible. According to the color revolution handbook, NGOs, student organizations and local organizations are funded, trained and coached to organize street riots as effectively as possible. The street violence must destabilize the country to such an extent that the government is forced to resign, or that the army intervenes and deposes the government. Since 2013, the opposition twice unleashed a cycle of large-scale violence. In 2014, 43 people were killed and 800 injured. In 2017, 131 people died. In the meantime the economic situation deteriorated very much. This was mainly the result of an economic model that is extremely dependent on oil prices, but also of an outright economic warfare against the regime. In May 2018, Maduro won the presidential elections with 68% of the votes. That was a blow to the opposition, from which it had to recover. 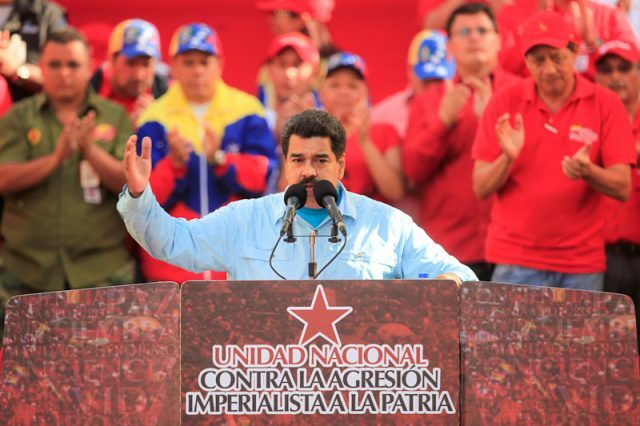 But when Nicolas Maduro was sworn in for a second six-year term on 10 January, it saw its chance for a new offensive. The US-controlled Organization of American States promptly declared that it would not recognize Maduro as president. Five days later Trump announced that he was considering recognizing [to recognize] Juan Guaidó as president. Guaidó is the thirty-five-year-old president of Parliament. He is very close to Leopoldo López, with whom he is in daily contact, despite his house arrest. Together they founded the right-wing party Voluntad Popular. In the past, this party organised armed pickets that killed people, set fire to public buildings and hospitals, led to attacks on ministries, etc. Strengthened by Trump’s backing, the opposition took to the streets the same day with the aim of ousting President Maduro and forming a provisional government. Amnesty was promised to the military who would defect. Six days later, on 21 January, some rebellious soldiers posted a video message online in which they declared themselves loyal to the opposition leader. Tensions increased. On 22 January, Michael Pence, vice president of the US, posted a video message calling on Venezuelans to take to the streets and get rid of Maduro. One day later, the opposition did what Pence asked, they massively took to the streets. There were also large counter-demonstrations by supporters of the government. Guaidó proclaimed himself the new president. He was immediately recognized by the governments of the US, Brazil and Canada, among others. Russia, China, Turkey and Mexico, a large and important country in the region, continue to recognize Maduro. Europe takes a cautious and moderate position. It is unlikely that the recognition of Guaidó by the US and some other countries will bring down President Maduro. But it may lead to further destabilisation of the country. The White House has opted for the strategy of chaos, as it has already done in so many other places. The recognition of Guaidó will give the opposition a boost. If Guaidó is not allowed to hold the presidency, this may lead to more economic sanctions. The US is currently considering a ban on oil imports. This would have serious consequences for Venezuela’s financial position and would further reduce oil production. An increasing number of recognitions of Guiadó as president will make it more likely that more countries will adopt economic sanctions against Venezuela. Threatening sanctions, stronger opposition and increasing violence will intensify the pressure on military officers and the PSUV top, in the hope that they will eventually change camps. At the moment a foreign military intervention is unlikely, even with escalating violence. But in the past Trump has not ruled out such an intervention. With the recent election of the belligerent Bolsonaro, such an intervention could possibly be outsourced by the US to Brazil, together with Colombia, Peru and other countries in the region. In any case, the interference in the domestic affairs of a sovereign country that the US is exhibiting today is unashamed and unprecedented. It violates the most elementary principles of the United Nations. The deadlock in Venezuela can only be resolved through national dialogue. Maduro, for his part, is in favor of calling for a dialogue, directed to the country as a whole by the governments of Uruguay and Mexico. Any foreign interference or pressure will only add fuel to the flames. Make No Mistake: There is a media blockade against Venezuela Regime Change Strategy Fails: Is a Military Invasion of Venezuela Next? Camilo Comes to San Francisco and Analyzes the Soft Coup Attempt in Nicaragua Guillaume Long: Do Right-wing Govt’s ‘Have the Stomach’ for Post-Coup Chaos in Venezuela?